In this information-overloaded twenty-first century, it seems impossible to fully discern or explain how we know about the past. But two things are certain. Whether we are conscious of it or not, we all think historically on a routine basis. And our perceptions of history, including African American history, have not necessarily been shaped by professional historians. In this wide-reaching and timely book, Pero Gaglo Dagbovie argues that public knowledge and understanding of black history, including its historical icons, has been shaped by institutions and individuals outside academic ivory towers. 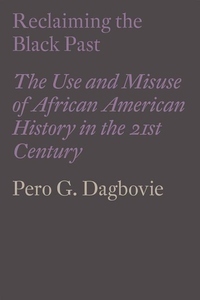 Drawing on a range of compelling examples, Dagbovie explores how, in the twenty-first century, African American history is regarded, depicted, and juggled by diverse and contesting interpreters--from museum curators to filmmakers, entertainers, politicians, journalists, and bloggers. Underscoring the ubiquitous nature of African-American history in contemporary American thought and culture, each chapter unpacks how black history has been represented and remembered primarily during the "Age of Obama," the so-called era of "post-racial" American society. Reclaiming the Black Past is Dagbovie's contribution to expanding how we understand African American history during the new millennium.